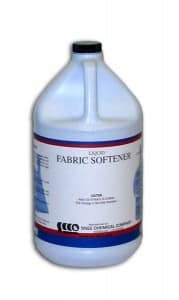 Liquid Fabric Softener, a liquid concentrate manufactured by Snee Chemical Company, is available for immediate purchase online at WorldwideJanitor.com. It is ideal for both home and institutional applications and can be ordered in bulk sizes for high volume washing needs including pallet quantities of 48 cases, making it an economical choice for businesses in the commercial laundry industry. Professional tests have consistently proven that liquid softeners outperform dryer sheets in removing static and making clothes softer. WorldwideJanitor.com is proud, therefore, to introduce Liquid Fabric Softener into the online marketplace as a quality and preferred softener option. This product conditions individual fabrics, counteracting the agitation and harsh damage that occurs when laundry detergent alone is introduced into the wash cycle. It also controls static, maintains towel absorbency, and softens clothing. Liquid Fabric Softener is phosphate free and comes in concentrated liquid form. Concentrated formulas are an economical option for consumers because they are manufactured using fewer resources. However, dilutions will vary according to soil load and washer size, so care should be taken by the end-user to ensure the solution is properly added, thus creating a product capable of performing as described. Refer to product label for further instructions. This product is ideal for use in homes, athletic facilities, hotels, motels, assisted living facilities, conference centers, office buildings, hospitals, and schools. It is available in gallons, cases, pails, pallets, and drums. This entry was posted in Laundry, News and tagged laundry, liquid fabric softener. Bookmark the permalink.